I made a list of all my WIPs. Want to see it? Why not, who doesn’t like a nice list? Here’s one more list. I found these kits hidden away in my closet. 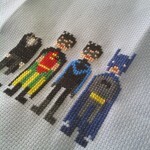 Batman & Friends by weelittlestiches (I love you guys! R0ck on!! \m/) I plan on adding Batman Villains 1 and 2 above and under the good guys. 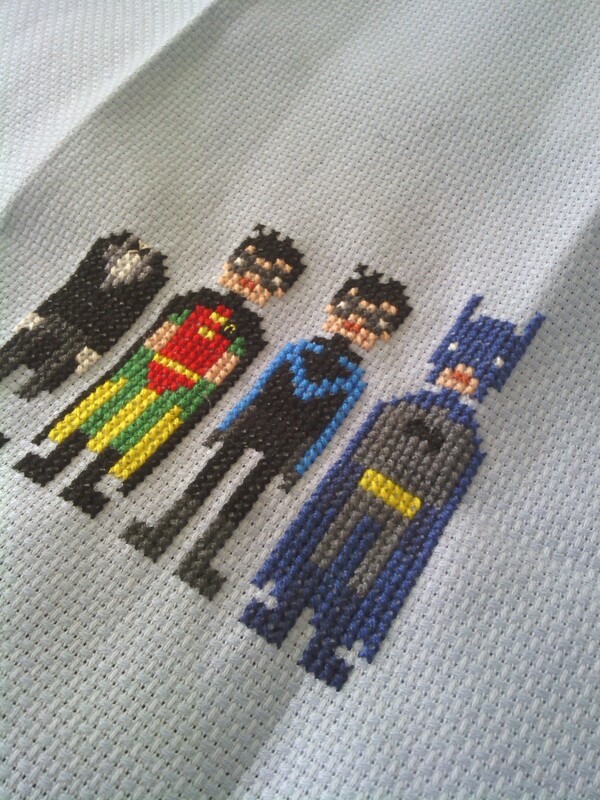 It will be my epic Bat-stitch adorableness. Batgirl is next after I finish Alfred. Yay! 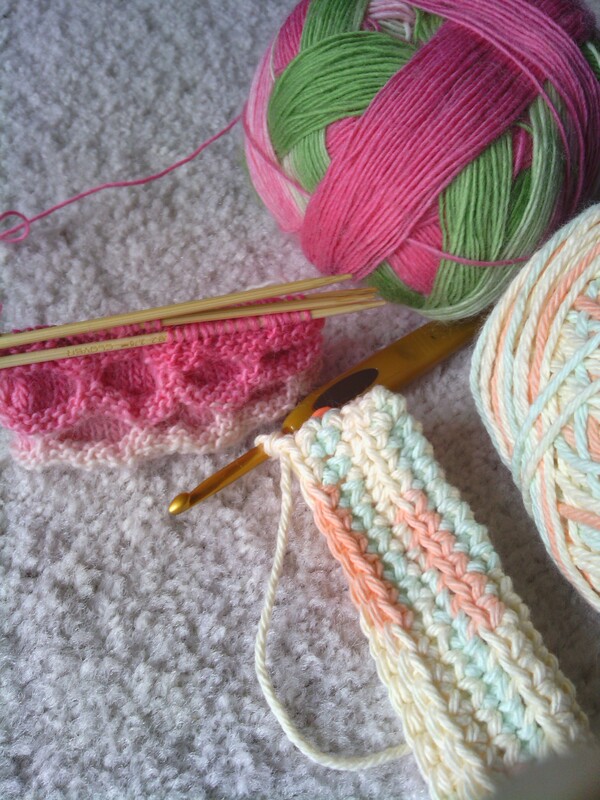 Check out weelittlestitches here. Poor headless Alfred. 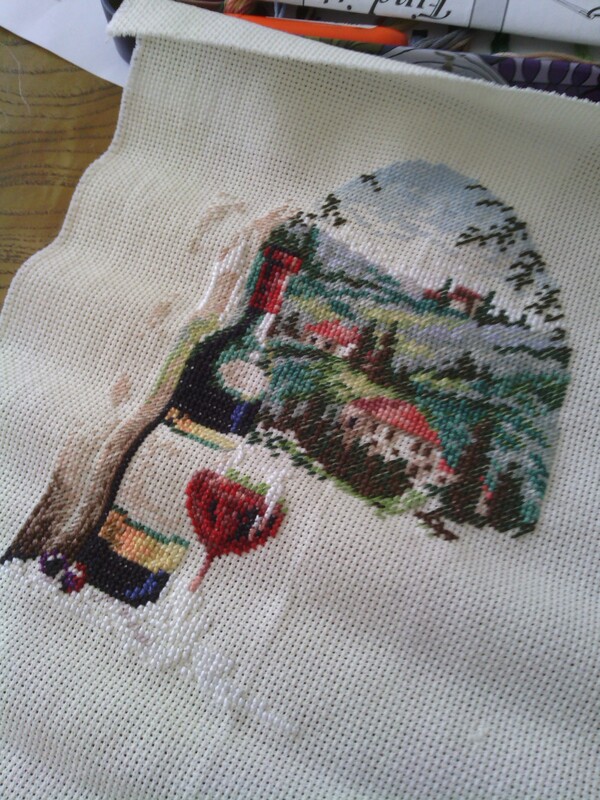 This is one I need to finish! I started it in 2010. It’s for my aunt and uncle. They love wine and Italy, so there you go. I’ll put their names and their wedding anniversary year on the bottle. 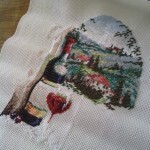 I admit I messed up a little, I missed a whole row while stitching the bottle, so it’s one row short. Meh. Not a big deal; I’ll fudge it when I get to the table area. I can barely notice it and I have the pattern. This one turned out more difficult than I had expected, mostly because the cloth is 18 point Aida. Sheesh! I need bright sunlight for those tiny stitches. I like how it looks though, and I bet I can finish it this summer! It is the Dreaming of Tuscany kit from Dimensions Gold Collection. 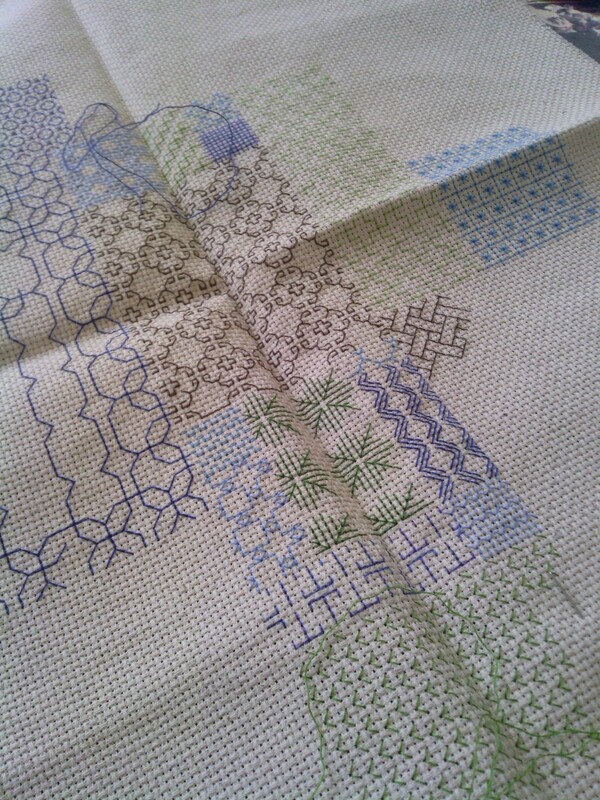 Finally I am still chugging along on a blackwork sampler by Celeena Cree. I met her on revelry and got this pattern free if I would test it. I admit I thought I’d be done by now, but what can I do? Kids, job, whatnot. I love this pattern SO MUCH. I chose my own colors for it to eventually hang in my bedroom. It’s so cool. I hope to finish this one this summer, too. First up! Roadkill Bunny and Prick Your Finger needle case from Twisted Stitches by Phil Davison at Urban Cross Stitch. I found this book at random at a big bookstore a few years ago. It’s incredible! 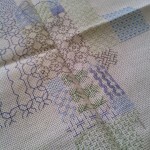 It’s full of off the wall patterns that are perfect for the non-traditional cross stitcher. I love every pattern in this book. Someday I’ll make the Kitchen Bombshell for my kitchen. And the Zombie Pin-up for my bathroom. Every girl needs a zombie pin-up in their bathroom, right? Anyway, I made the roadkill bunny first because it was small and quick and grossly adorable. I was either pregnant or just had a baby when I started it, though, so once I got to the roadkill one I couldn’t finish it! I can’t explain it other than I was full of mommy hormones. They are a force to be reckoned with. I cried over this pattern, people. Full on saddened by the bunny’s fate. Mommy hormones are wild. So I put it aside for another day. Sure enough, a couple months later I finished it no problem! 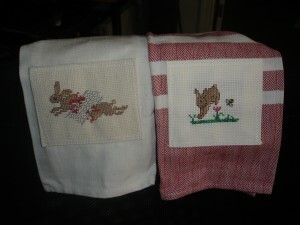 I stitched both of them on 14 Aida with some scrap thread, matching the colors as best as I could. I put both on a kitchen towel for a birthday present for a friend’s 42nd birthday. It was her 42, so naturally she got a towel. Plus, she flipped out when she saw the pattern months ago when I bought the book. It was a nice surprise. Wins all around! Much more fun than framing it. Next up is the needle case. This one is for another friend (you may notice a trend here; I love to stitch more than I love to keep stuff) for her birthday. Well, that birthday came and went. 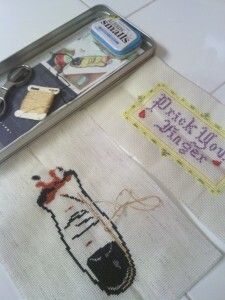 Still, I got back into the groove of this one and now I’m almost done with the stitching part. Just the thumb flesh left. 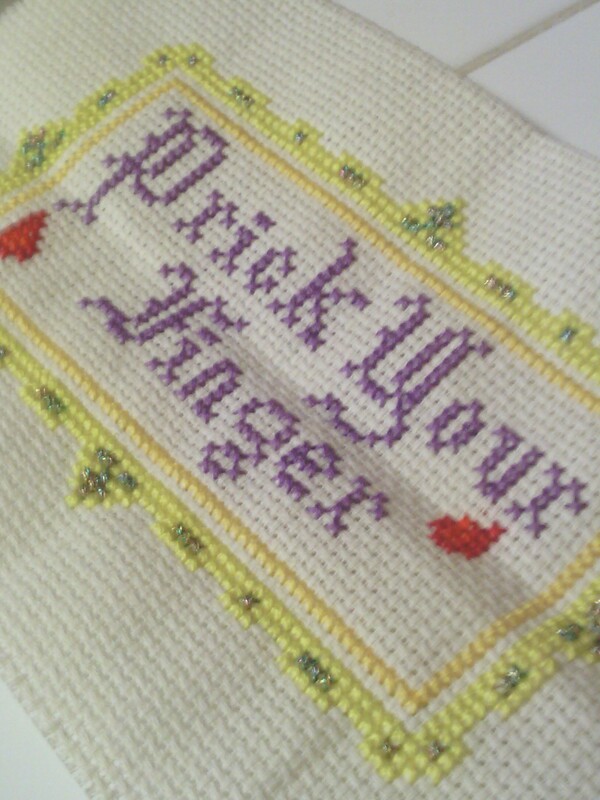 Isn’t it fun to associate thumb flesh and cross stitch?? I love these guys. I used a leftover 14 count Aida scrap for the words. I used scrap thread for most of it. This was another one of those projects that was just being difficult. I got as far as the words and blood drops, but couldn’t decide on the border. Back to the shelf it went until I decided on DMC 306 for the main border and DMC Light Effects E135 for the accents. Those metallics can be fussy to stitch with, but man, it’s worth it! Perfect. I am using 22 count leftover Aida for the thumb, for two reasons. One: it’s what I had. Two: the thumb is deceivingly huge and the 22 count made it fit the 14 count words piece. Sheesh. I mostly used the suggested colors for the thumb, since my floss collection has grown quite a bit since last year (I blame weelittlestitches-I’ll get to them another day). I am using a different color for the flesh, DMC 436, because I like it better. The suggested one was too peachy for me and 436 better matches the skin tone of the recipient. I know, kinda weird, but yes, that matters. It’s the little things. I don’t always fly by the seat of my pants on projects. I have a lot of kits (mostly Dimensions) that come with everything I need. I keep all the extra thread from said kits in a box and it’s fun to use those extras/scraps for small projects like the bunny. It gives it a slight spin from the original and it is always a surprise in the end. Stay tuned! We’ll see what surprises lay in store.